You will find the right setting for all kinds of family parties in our Hotel Waldesruh with its fantastic views of the surrounding area. Birthdays, golden weddings or any other kind of anniversary. Here in the heart of the Ore Mountains there are numerous ways you can combine your celebrations with a lovely walk, a carriage ride from the hotel or a visit to one of the numerous castles in the area. 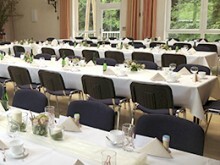 The Waldesruh team will be pleased to help plan and organise your celebrations and parties. The “Conservatory” can be divided up into smaller rooms for celebrations. The “Gute Stube”, which only used to be used by the grandparents on Sundays, is the ideal setting for your family celebrations with its exclusive fittings. The “Landhaus” is the lighter part of the restaurant that our guests like to use for a cosy meal or in the afternoon for coffee and cake. The “Bergmannskaue” is furnished in a stylish and rustic manner and has been decorated with a number of mining details. Would you like to make a reservation, request a quote or simply more information?